Cranberry and orange are a classic flavor combination. 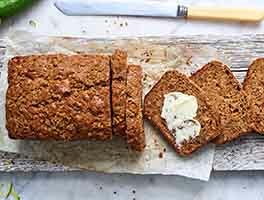 This gluten-free quick bread adds sorghum flour for body. 58 mins. to 1 hrs 8 mins. 1 hrs 43 mins. to 5 hrs 43 mins. Preheat the oven to 350°F with the oven rack in the middle. Lightly grease an 8 1/2" x 4 1/2" inch loaf pan. 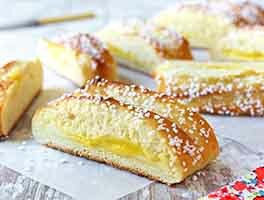 Place the sugar, soft butter, salt, baking powder, and grated orange rind or orange oil in a mixing bowl. Beat with an electric mixer until fluffy. Whisk together the flours, milled flax, and xanthan gum. Beat the eggs into the butter mixture one at a time, scraping the bottom and sides of the bowl between additions. Add the dry mixture about 1/3 cup at a time, alternating it with the orange juice. Stir in the cranberries and nuts. Scoop the batter into the prepared pan, mounding it in the center of the pan to create a dome shape. Sprinkle with coarse sparkling sugar, if desired. Bake the bread for 58 to 68 minutes, until it's golden brown on the top. If you have a thermometer, the internal temperature should be 200°F or higher; see tip below. Remove the bread from the oven, and allow it to rest in the pan for 15 minutes, then transfer it to a rack to cool completely. The bread is tender, and will slice with less crumbling after it's completely cool, about 4 hours. 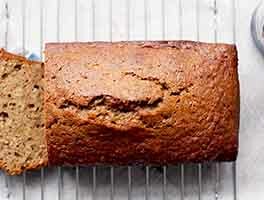 It's often difficult to be sure gluten-free quick breads are fully baked in the middle. A cake tester inserted into the center may come out crumb and batter free before the bread is fully baked; thus, using an instant-read thermometer is a good idea. 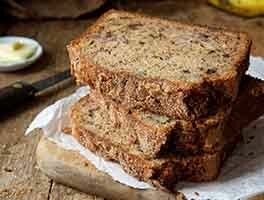 First off this quick bread had great flavor and texture and I would make it again. I used yoghurt instead of orange juice hoping this would help deal with the crumbly aspect of this bread and whole fresh cranberries, but I didn't win that battle. Regardless, the bread was moist, correct texture, the cranberries added a nice tart pop and I put KA sparkling white sugar on top for crunch. I'll keep working on this as I would love to have a nice thick slice toasted and buttered for breakfast. This was a delicious recipe, however like a few others, mine was dry. I make your brown rice flour mix regularly and that's what I used. I baked until about 204 degrees - maybe try to bake it until just 200 next time. I'm wondering if I could sub out the butter for oil (maybe canola) and that might help the dryness? 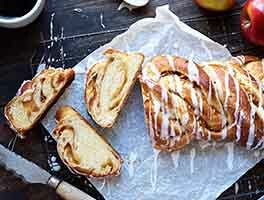 Can I use a covered baker? Your tips indicate using an instant read thermometer to ensure the GF bread is done. What temperature should it read? Delicious! I do sometimes add 1 teaspoon cinnamon and 1/2 teaspoon of cloves for a wonderful tart and spicy flavor. I also substitute the flax with almond flour. The taste and smell of this bread were amazing. My only issue was that it was dry. I used the make-it-yourself mix of rice flour, tapioca starch, and potato starch (which works beautifully for every other recipe I've tried), along with the sorghum, etc. I made the GF coconut banana bread the same day and it was wonderfully moist. I was wondering if adding Greek yogurt might help add in some moisture next time. 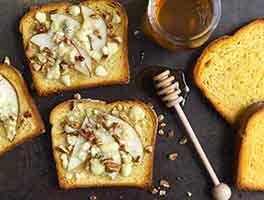 I love the flavor, and would like to find a way to make it work. Perfect! I used raisins instead of dried cranberries but it still turned out great. Just made this recipe and had my first two slices. I toasted the second and added some butter and cinnamon sugar to it and it was delicious. The recipe suggested using a thermometer to test for doneness. I removed my loaf at 202 degrees and it was perfect. This recipe is wonderful. Tasty, Yummy.